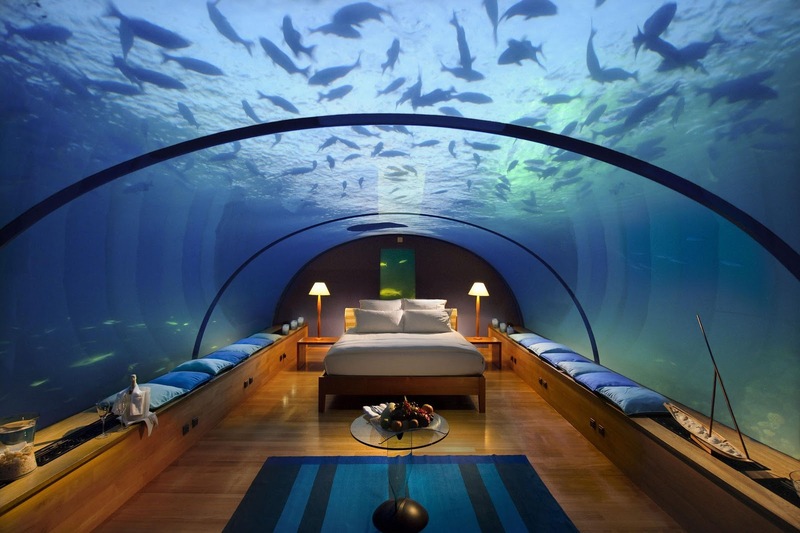 With underwater hotels already a reality and plans in the works to send tourists into outer space, it sometimes feels impossible to find a truly adventure-worthy destination. But planet Earth still has plenty for the intrepid traveller, and we are here to prove just the same. 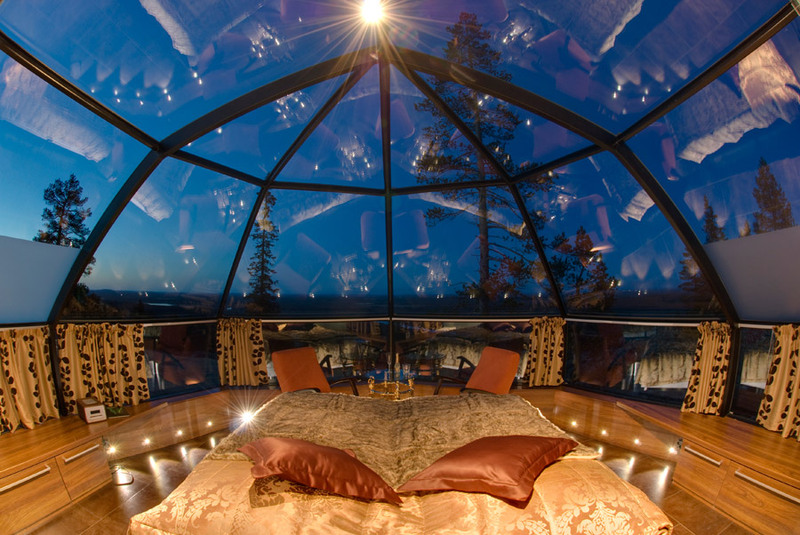 From glass igloos in far-flung Iceland to guest rooms within a volcano, each accommodation immerses its guests in a unique experience. Whether you scuba dive to your front door or reach it by way of a hanging bridge, we think you'll be impressed by the ingenuity, originality and yes, even luxury, offered by these singular properties. For the ultimate outdoor retreat, Whitepod delivers. 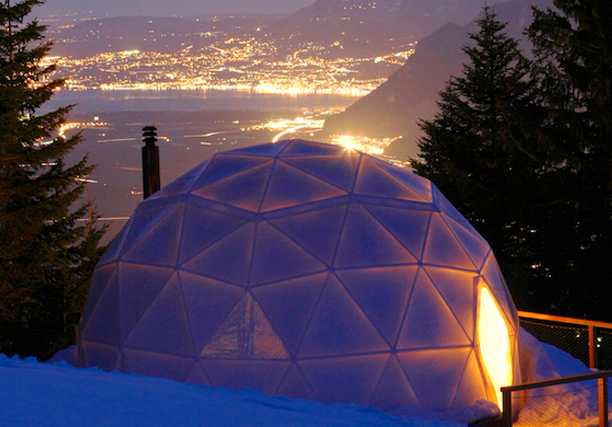 Situated in the Swiss Alps at an altitude of 1,400 meters, the camp consists of 15 pods. With the look of giant boulders, these dome-shaped tents are pitched on raised wooden platforms surrounding a refurbished alpine chalet. Each mountain-chic lodging is heated by a wood-burning stove and has its own private front terrace overlooking the valley. 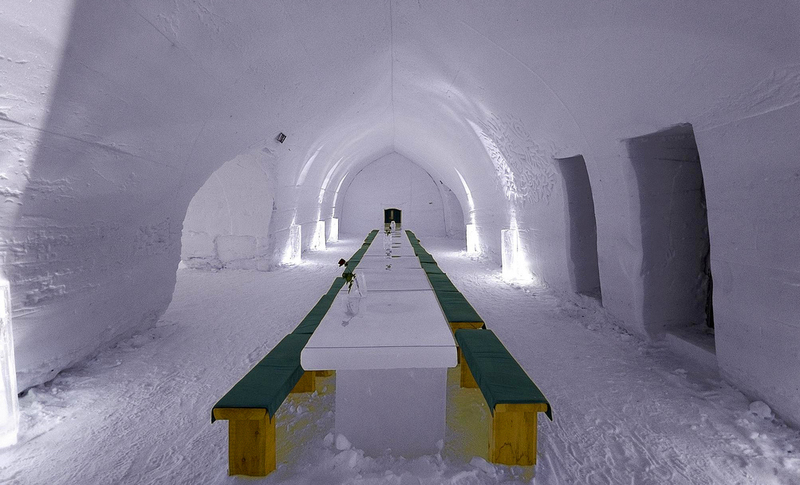 The chalet features a Swedish sauna, massage area and communal space, where guests gather for breakfast and evening drinks around the fireplace. For those who dream of starring in their own space odyssey, this family-owned enterprise provides an ideal setting. 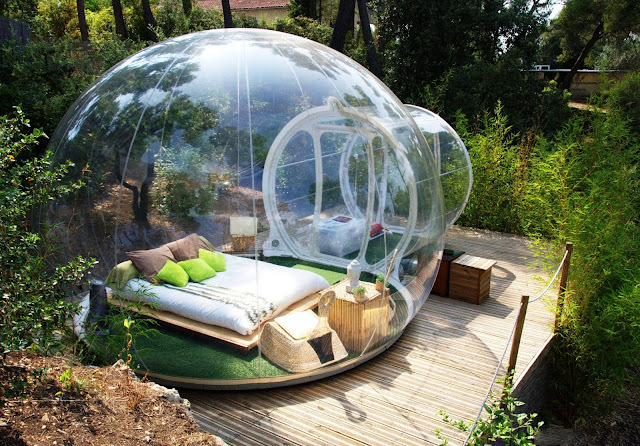 Campy meets camping in bubble accommodations with themes ranging from Zen to 1,001 Nights. But these bubbles offer more than just a unique experience. Made from recycled materials, they are eco-friendly, and are deflated at the end of the season, ensuring minimal impact on the surrounding pine forest. 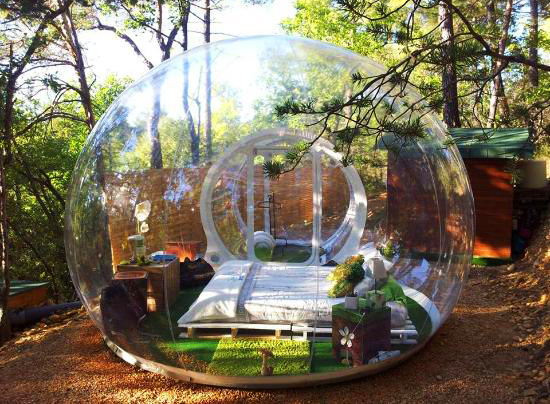 Although the bubbles are sheer, privacy is ensured, from individual bathrooms to secluded locales within the property. 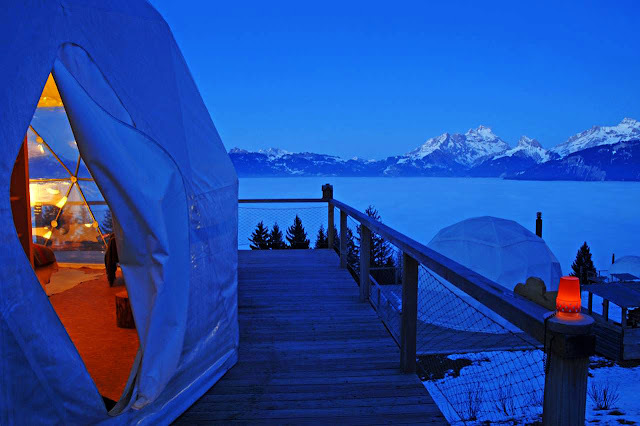 Packages heighten the experience, with extras such as organic wine, gourmet dinner, massages and a telescope and star chart for the ultimate in bedtime stargazing. 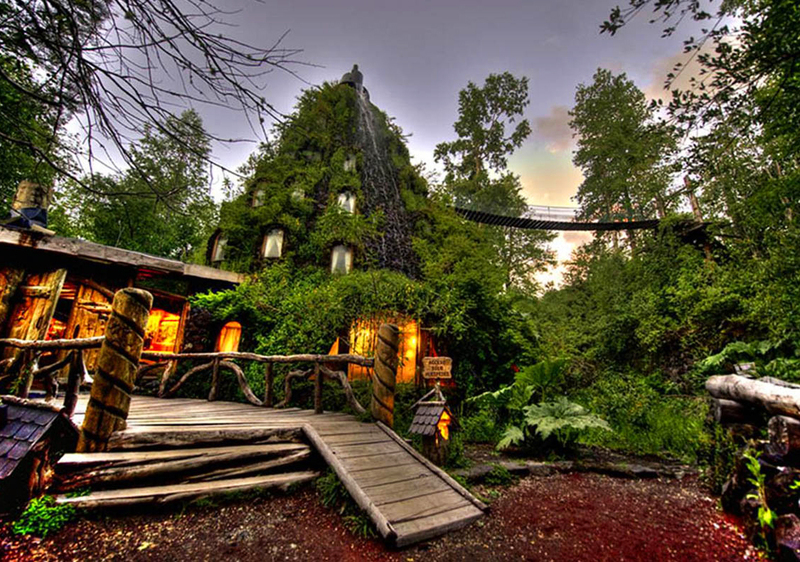 This volcano-shaped hotel in Chile features water cascading down its sides rather than lava. Visitors can choose standard rooms or suites (on the ground level), all built by local craftsmen, with walls, floors and ceilings made of native wood. Naturally heated bathtubs are crafted from ancient tree trunks, and rates include a welcome drink and buffet breakfast. Along with luxuries like a spa and artisanal brewery, the vast property offers a wealth of activities, from trekking to mountain biking to the thermal baths of Pirihueico Lake. 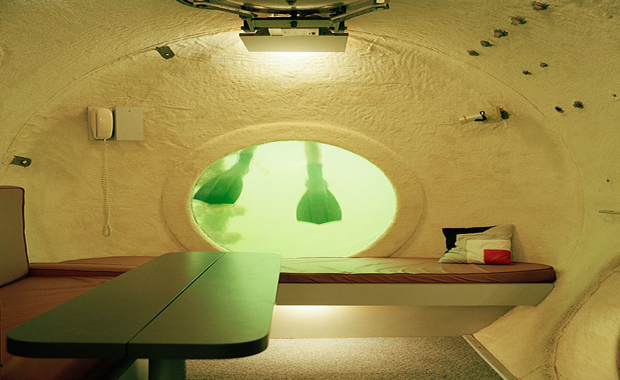 Named in honor of the fantastical world created by author Jules Verne, Jules' Undersea Lodge began life as an authentic research habitat, and today it is a hotel for up to six people. 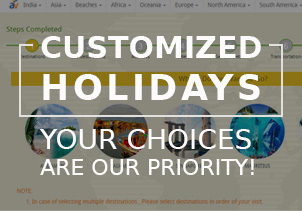 Guests with dive certificates are invited to enjoy unlimited diving. As for novices, a three-hour course is required in order to reach the hotel, but this also allows newbies to enjoy dive excursions in the lagoon with an instructor. Although the lodge is by no means a luxury retreat, it does offer a thoughtful selection of creature comforts, including packages featuring gourmet dinner prepared by a "mer-chef." 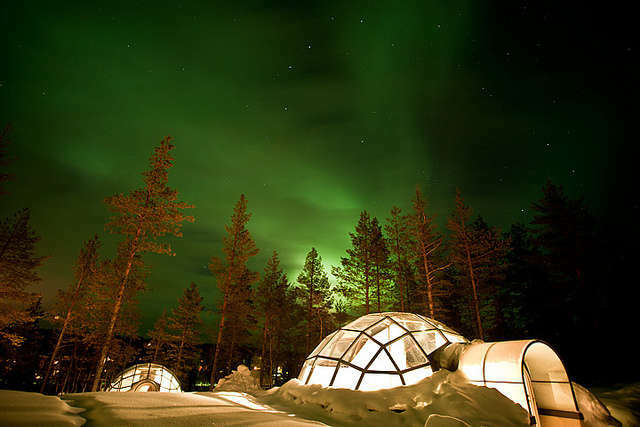 Situated next to Urho Kekkonen National Park in remote Lapland, this resort features a variety of lodgings, including gorgeous glass igloos. 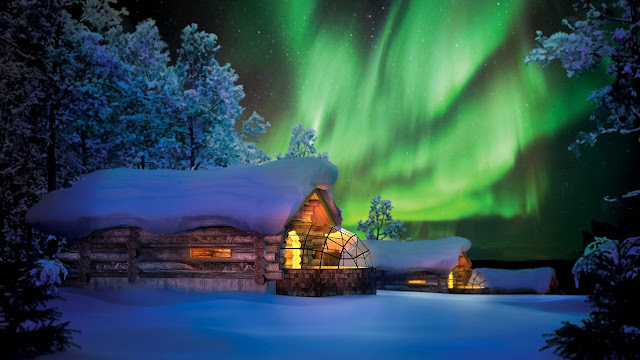 Built of thermal glass and designed to stay frost free, these truly unique guest rooms offer the opportunity to watch the northern lights from the toasty comfort of your own bed. 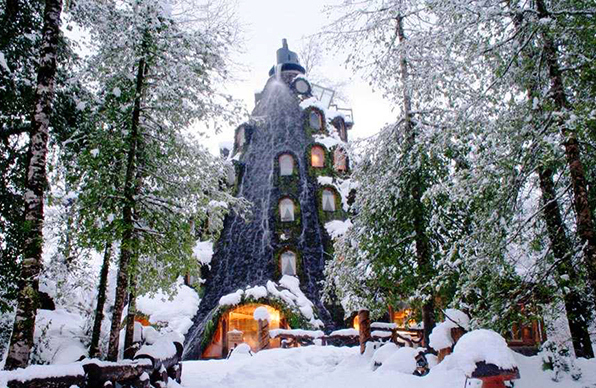 You can also stay in classic snow igloos or log cabins. To round out your unforgettable experience, you can embark on a reindeer-pulled sled tour or take an excursion to the nearby Arctic Circle.